“These rugged Cat5e Ethernet cables were designed to address harsh industrial and military applications in the field. The LSZH jackets are ideal for use in confined areas...,” said Mark Hearn, Prod. Mgr. MilesTek, a leading manufacturer and supplier of products designed to address military and avionics applications, announced today that they have released a new series of Category 5e industrial Ethernet patch cords with low-smoke zero-halogen (LSZH) jackets and double shielding to address demanding industrial and military Ethernet connectivity applications. These rugged Category 5e-rated assemblies can be used in various applications including mobile and fixed military communications networks, oil and gas, automation, manufacturing and any application where harsh environments exist. Offering maximum protection against EMI/RFI interference, MilesTek’s double-shielded Cat5e patch cables feature two layers of shielding to ensure data is protected from stray EMI/RFI fields. Additionally, these new cable assemblies feature 24AWG solid conductors which allow for easy termination to IDC connectors and LSZH jackets to protect valuable equipment and lives in the event of a fire. 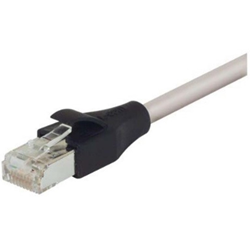 “These rugged Cat5e Ethernet cables were designed to address harsh industrial and military applications in the field. The LSZH jackets were developed for use in confined areas such as tanks, submarines, aircrafts and communications rooms,” said Mark Hearn, Product Manager. These new cables are in stock and available for immediate shipment.